Pink DSLR - Oh So Girly! For a long time now I’ve been meaning to upgrade from a point and shoot camera to a DSLR in my goals to learn to take more professional-looking photos with a larger variety of advanced settings and options to get creative with and play with. A pink DSLR! 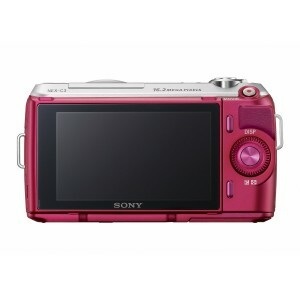 Or more specifically a Sony NEXC3 Hot Pink Digital SLR Camera. The reviews for it were really impressive: out of 41 reviewers, 33 gave it a score of 5/5! 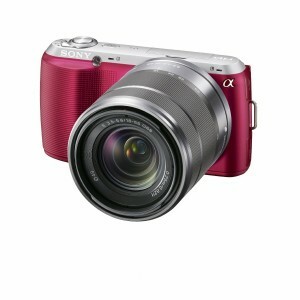 This camera’s definitely going into my “finalist contenders” list in my search for a DSLR. This pink DSLR’s interchangeable lens (one of the features I’m more excited about with a DSLR) enables you to choose zoom capabilities of your choice. It comes with a fixed 16mm lens, but there is also a 18-55mm zoom lens and you can always buy other lenses you can play with. One reviewer said: “you can take professional-grade pictures without having to be a profession”. Points that were made in the reviews highlighted great depth of field, rich colors, detailed backgrounds and shadows and fantastic photos even in low light conditions. 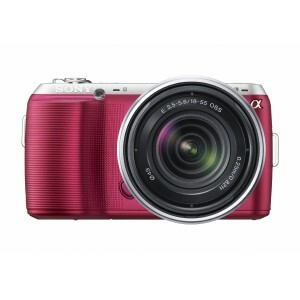 On the whole this pink DSLR is said to capture high quality, professional-grade images. Browsing through the reviews it seemed a consistent comment that the image was sharp and photo quality was excellent. A large sensor enables light sensitivity that explains the excellent quality photos even in low light conditions. One reviewer said that with the small lens on it, it fits in your pocket, which sound convenient since one of the off-putting factors for me in the past with DSLRs was that they are so bulky to carry. I also did spot this other pink DSLR on Amazon by Pentax (the Pentax K-X 16329 Digital SLR) although it has less megapixels (12.4 vs the Sony’s 16.2) and seemed to be an older camera with fewer reviews so I’m definitely leaning more towards the Sony.